In Paper > Show & Tell. Having seen Joanna’s test transmission yesterday morning of a cute Koala face, I was reminded of this cartoon. I found it thrifting at the Salvo’s about five years ago. 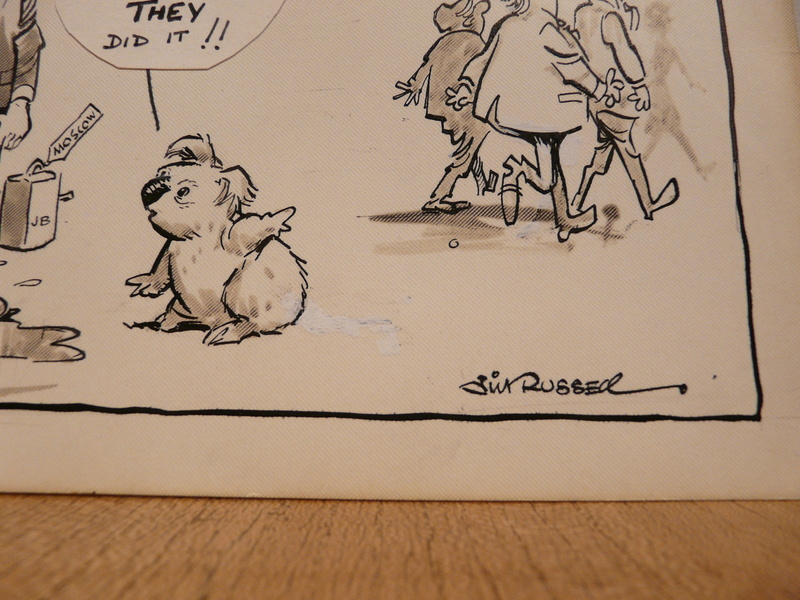 It’s an original cartoon by arguably Australia’s greatest cartoonist Jim Russell (26 March 1909 – 15 August 2001). 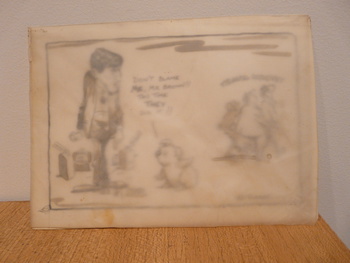 In 1928 he became Australia’s youngest cartoonist and the records kept on piling up for Russell who is best known for doing a comic strip called "The Potts". 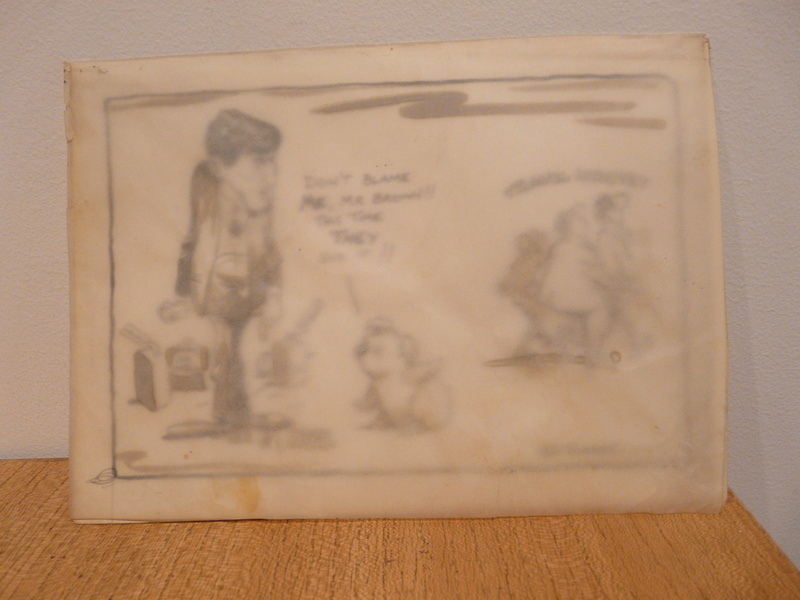 The strip ran in a number of top Australian papers for over 60 years - a world record for drawing a comic strip unaided. In 1924 Russell was one of the founders of the Black and White Artists’ Club. He succeeded Cross as president in 1955-57, then again in 1965-73. 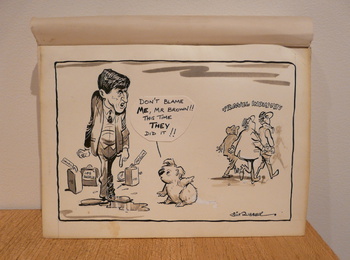 He won the Club’s first Silver Stanley in 1985 for his contribution to black and white art, was appointed its patron in 1984 and a life member in 1991. 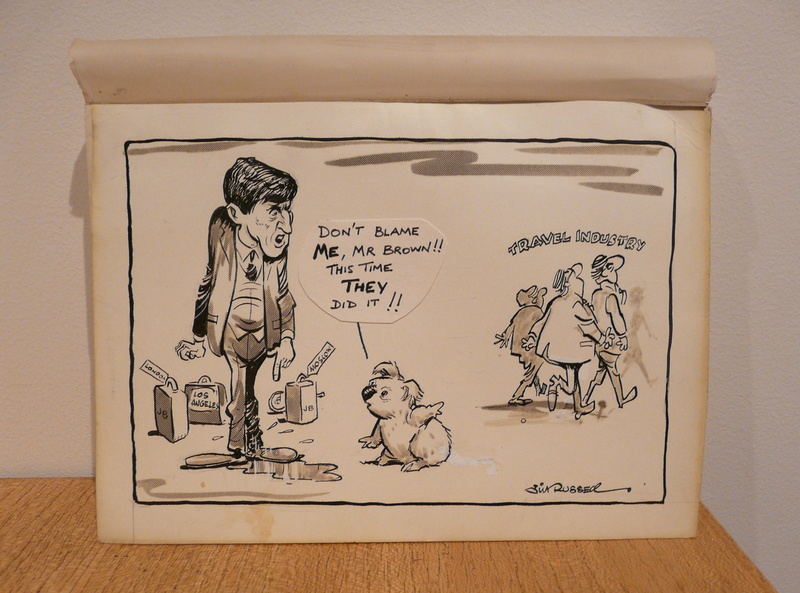 In 1993 he was elected a member of the United States National Cartoonists Society, the only Australian ever to receive this honor. In 1978 he was awarded the MBE, then later the AM. 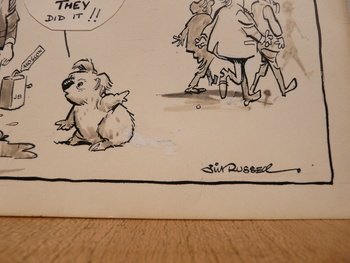 The Australian Cartoonist's Association Silver Stanley Award is now known as the Jim Russell Award and is awarded to a cartoonist for services to the cartooning industry. Russell also wrote film reviews and other articles, was a radio and television personality, a publisher of dancing and music magazines and ran two travel agencies. That’s the cartoonist and the cartoon needs some context and explanation. I still don’t know which paper ran it or if it was published. Russell was unhappy with the minister for Tourism after his return to Australia. As a travel agent himself there is an un-declared “conflict of interest”? On the left is John Joseph Brown AO (born 19 December 1931) a retired Australian politician. In the 1980’s he was the Minister for Tourism in the Federal Government. He was responsible for the campaign that some Americans may remember and introduced you to the archetypical Ozzie Paul Hogan aka Crocodile Dundee: "Put another shrimp on the barbie!" And then there is the koala. The koala is acting innocent and fingers the “travel Industry” for the state of Brown’s trousers. Koalas are “ flea-ridden, piddling, stinking, scratching, rotten little things”. “Dear John. He got his face all over the media, all right. A koala handler gave him a koala to cuddle, as he had insisted upon, but this particular koala was, evidently, on a bad trip. Instead of docilely allowing itself to be cuddled, the koala, doubtless with strains of Jefferson Airplane in its ears, squirmed, and scratched, and bit, and unleashed a stream of foul smelling pee all over Minister Brown’s expensive suit. On this occasion the Minister got a “Dear John message” from Russell! There are in fact 8 watercolours by the Davidson twins on CW. Many thanks toracat, Sean B, manikin, blunderbuss2 & mustangtony too! Many thanks yet again Sean and to you too Joanna! Many thanks czechman and my sweet Amber! Many thanks Phil and Dan too! I wonder if He met Charles Schultz..Probabally!! No idea mate. I will have a look but you never know. Small world. I'm sure they have, considering the U.S. Natal. Cartoonist society, I mean, with Austrailias' finest with whom I consider the finest, Shultz, from the U.S., I'd say they read each others strips..lol! Kind of like Mick Jagged calling up Paul McCartney and inviting him for dinner! Boy..I'd like to be a fly on the wall during that meal! Lol! I know Kevin, I went there! !